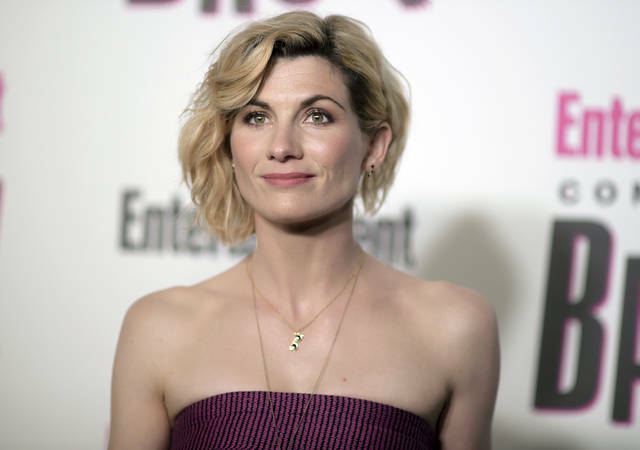 NEW YORK (AP) — Jodie Whittaker calls being cast as the first woman to portray Doctor Who “a step in the right direction” when it comes to gender equality in Hollywood, but doesn’t feel that she’s broken a glass ceiling because there’s more work to be done. 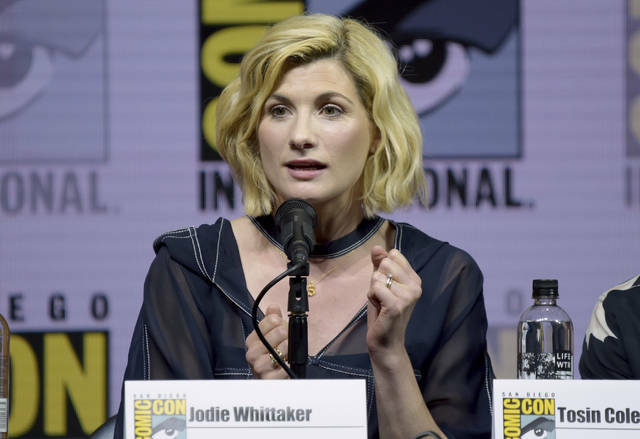 Moments before the latest season of “Doctor Who” debuted in a global-wide telecast on Sunday, Whittaker was at New York Comic Con with show-runner Chris Chibnall, and Executive Producer Matt Strevens talking about the new season and the historical casting decision. “Do I think the glass ceiling is broken? No. Do I think that this is a positive step in the direction of equality in the representation on film? Yeah. But it’s not broken,” Whittaker said. Twelve-year old Danielle Nickelson, dressed as Harley Quinn, was glad to see a woman in the role. “I like that they made it a woman, because usually nowadays shows don’t really have girls in them. It’s more like boys, like Spider-Man,” Nickelson said. And in-between practicing moves from her favorite video game, “Street Fighter,” longtime fan Lia Vanderlinden had her own take on accepting the new Doctor. DELAWARE, Ohio – Stéfanie von Hlatky, Ph.D., former director of the Centre for International and Defence Policy at Queen’s University, Ontario, will discuss “Gender Considerations in Military Operations: Mission Critical?” Oct. 24 at Ohio Wesleyan University. Columbus, OH (October 9, 2018) – Each year, one in four North American households are scammed. Because money loss and identity theft can happen to anyone, BBB encourages community members to protect and inform others by reporting any scam-related experiences to BBB’s Scam Tracker. In September, Central Ohio consumers reported $1,385 lost to scams. Scam Callers: The most prevalent type of scam in September was scam calls. Learn more about how to avoid scam callers with these BBB tips. Advance Fee Loan Scam: One consumer reported losing $544 to a loan scam. He looked online to find a place to borrow money, applied, then paid a $100 fee. He was later contacted by a John Williams, telling him his loan was approved and they needed his bank account information. They deposited $754, then withdrew all of the money in his account the next day. Tips for Advance Fee Loan Scams. Online Shopping Scam: Three different consumers reported losing money in online shopping scams. One local woman lost $199 through a website using the name “American Online Bankruptcy Center”. The website stated they get documents ready to file bankruptcy, but once you pay, they do not do any of the work. The website has no direct email contacts, and only automated phone messages. A Columbus, Ohio man bought a version of the NES video game console system for $54 online, and received an email stating he would be sent shipping information shortly. He was never given any valid shipping information, and was told that due to a large amount of orders, they were backed up. Eventually, they stopped responding to his emails and the original links he had to their website no longer work. A woman in Columbus, Ohio ordered items for $150 through All Any Mall on Facebook but never received her order. She looked up the registration for the URL and believes the company is fictitious. She has contacted her bank, which shows that her payment went to Asia, and her money was credited back. Tech Support Scam: Two years ago, a Columbus, Ohio man lost $200 to a tech scam. He reported his computer freezing, and a pop-up with a 1-800 number showing up claiming he had a virus. He called the number and paid $200 for them to take care of the virus. Later that evening, his daughter experienced the same thing. Since then, the scammers continue to contact him saying that he owes $200 a year. One of the callers is using the name Mark Hunter. Tips for tech support scams. ORLANDO, Fla. (AP) — President Donald Trump drew an enthusiastic response from a law-and-order crowd Monday, advocating the use of “stop and frisk” policing and saying he has directed the Justice Department to work with local officials in Chicago to stem violence in the nation’s third-largest city. Chicago’s violent crime has repeatedly drawn national attention — and Trump’s — as shootings and homicides climbed to levels not seen in nearly two decades. But the number of homicides has fallen — from 771 in 2016 to 650 in 2017, with a further decline expected this year. The number of slayings still exceeds numbers in Los Angeles and New York combined. Soon after becoming president, Trump tweeted, “If Chicago doesn’t fix the horrible ‘carnage’ going on … I will send in the Feds!” Emanuel said he welcomed federal help but cautioned against the strictly “tough and rough” approach Trump seemed to advocate. Trump’s comments came three days after a jury convicted white Chicago police officer Jason Van Dyke of second-degree murder in the death of black teenager Laquan McDonald. Video showing Van Dyke shooting McDonald 16 times as he walked away from police carrying a knife stoked outrage nationwide and put the nation’s third-largest city at the center of the debate about police misconduct and use of force. “Politicians who spread dangerous anti-police sentiment make life easier for criminals and more dangerous for law-abiding citizens,” he said. “The Democrats fight us at every turn. Whether it’s law enforcement or military. They fight us at every turn. And we win,” Trump said. The recent announcementby the founder of Amazon, Jeff Bezos, that his company would give substantial raises to its lowest-paid employees should not blind us to the fact that most American workers are not receiving big wage increases. In fact, the real wages (that is, wages adjusted for inflation) of average American workers are declining.